Breathtaking beach and ocean views, centrally located, convenient to public transportation and only 10 minutes from Hamilton. This large beachfront studio apartment is only steps away from Marley Beach, a romantic, secluded, private beach on Bermuda's famous and beautiful South Shore. Sand Pebble Studio has a fully-equipped upgraded kitchen, a large bed/sitting room with king sized bed, dining table/chairs, flat-screened TV, patio with umbrella, table, chairs and barbecue. Beach chairs are provided. Marley Beach with its pink sands and crystal clear waters has some of the best snorkeling in the area. Other area attractions include nearby restaurants, parks, Elbow and Horseshoe Beaches, Gibbs Hill Lighthouse, golf, tennis. Year-round, the sunrises are spectacular. Marley Beach Cottages was previously a small hotel, but Sand Pebble Studio is the only beachfront studio apartment currently available to visitors. Sand Pebble Studio at Marley and Special Times: Marley Beach Cottages was a well-known, small, intimate, casual and convenient hotel in years past. Ownership changed recently and it is no longer operating as a hotel. The current owner - Steve (son of June Stanton) and familiar to past guests of Marley, has renovated Sand Dollar and Sea Song both two bedroom cottage, and, Sand Pebble Studio. All three are are currently available to short term visitor rentals. WHALE WATCH FROM YOUR PATIO!! From about mid-April through to end of mid May, you can enjoy watching for whales and their calves as they overnight just offshore for protection from predators. Seeing the whales breaching and blowing is an experience that leaves you feeling privileged indeed! BOOK EARLY for those weeks! Making Memories: Many memories have been made at Marley. The beach was made famous in quite a few movies, including Chapter 11 and The Deep. During the winter months, Bermuda's temperature range 68 - 72. There are many times when the temperature is in the mid 70s and on the South Shore, it feels like 75, with calm, sparkling waters, clear skies and warm breezes. Perfect weather for the beach, golfing, tennis, walking and more. 'Life is not measured by the number of breaths you take, but by the number of moments that take your breath away'. All year the sunrises, clear turquoise waters, moon rises, and rainbow glimpses will certainly take your breath away when you visit us at Sand Pebble Studio at Marley Beach. Golf, Tennis, and nearby Dining: Golf can be arranged at Riddell's Bay Golf Club, Mid Ocean Club, Port Royal Golf Course, Ocean View Golf Course, Belmont Hills and more. Ask us about this before you arrive, as tee times can be made in advance. Nearby tennis courts include the ones at Elbow Beach Hotel and Fairmont Southampton Princess Hotel. Restaurants within 10 minutes are: Henry VIII, Tio Pepe, Waterlot Inn, Bacci's, Swizzle Inn West, The Seahorse Grill at Elbow Beach Hotel, and Mickeys on the Beach at Elbow, Cafe Lido, Mickey's, Paraquet, Fourways Inn, Beau Rivage at Newstead, Blue (at the refurbished Belmont Golf Course) and Island Cuisine at Riddell's Bay. Sand Pebble Studio, is located on Marley Beach. A great place to hang out and relax. A really beautiful setting. Great central location right on the beach. Plush bath and hand towels are included and there are plenty of extras provided. There is a pedestal sink, toilet and tub with shower. Even the bathroom has ocean views from the window!! Free cell phone for guests' use during their stay. Sand Pebble Studio at Marley Cottages. We had a great time. Wonderful view and very private beach. One hiccup, the greeter was late arriving and checking us in, but very kindly drove us for groceries. We rented an Anaig back to back vehicle. A lot of fun to drive but better for short people. A surly cab driver took the long route from the airport and the cab ride was $55.00 with tip. A friendly driver took a short cut back to the airport $42.00 with tip. Bill and Carol. The studio apartment was clean and neat when we arrived. Steve and Gordon are amazing and very accommodating hosts. There is a stunning view right out the window and is literally steps away from a super quiet beach. There is also a bus stop to the city right there. Lovely accommodations with an absolutely gorgeous view of the ocean! We stayed at Pebble Beach for a week. It had everything we needed. The view was amazing, sunrise and secluded beach below. The bus stop is at the end of the driveway, very easy to use. Definitely get your liquor at the airport, it is 1/2 of what you pay at a store. Also, get Lindo's to deliver your groceries, it makes it a lot easier than hauling everything on the bus or walking. We walked to Swizzle Rest. which was a short walk. Woody's is a fun local place, eating outside w/locals. Lobster Pot in Hamilton had amazing lobster. Horseshoe Bay beach was beautiful. We believe we stayed at the best place on the island. It was perfect!! Well kept property with an amazing view! We had a wonderful time visiting Bermuda for our honeymoon and our stay at Sand Pebble studio was just perfect for the two of us! It was very clean and well kept with all the essentials needed. The area is so peaceful and private! Pictures definitely do not do it justice! We are already looking forward to our next visit and will definitely stay at Sand Pebble again!!! Highly recommend! Gordon and Steve were both a pleasure to work with! Absolutely Perfect!! Steve and Gordon couldn’t have been more helpful and accommodating. This was our 8 day honeymoon. We are in our young early 60’s and my wife fell ill the day before our departure. I notified Steve that we would be a few days late for arrival...he responded to keep him posted. In the same day he notified us that the cottage was open for the for the 3 days after our departure date and we were welcome to extend our stay on him. This made my day, such a kind gesture. The cottage was everything we expected, clean, well appointed, perfect location. The view is absolutely beautiful, listening to the surf as you go to sleep and watching the sunrise in the morning. Can’t beat it!! A terrific private beach a few steps away.......but the exercise is good for you! Only downside was the pillows...maybe needs new pillows. 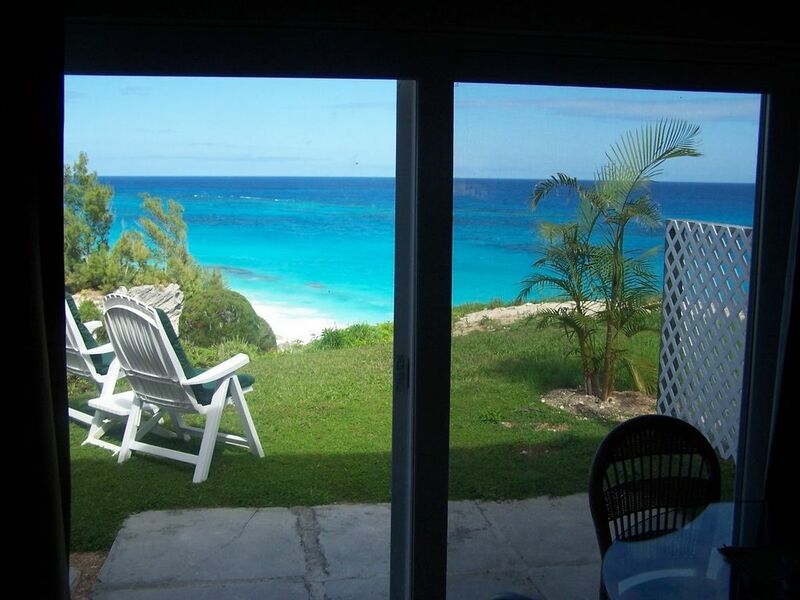 Sand Pebble Studio is a short walk down a path and some steps to our own private Marley Beach, situated right between two of Bermuda's most famous beaches -- Elbow Beach and Horseshoe Bay. It is nestled between two parks -- Astwood Park and Southlands. You can quickly and easily explore Bermuda by taxi, bus, or moped from our central location. In the summertime, your vacation will be perfect as you snorkel the crystal clear water and watch the parrot fish and others on the shore front or outer reefs. Everything the vacationer could desire is nearby, including spas, tennis, golf, fine and casual dining and more. Wintertime is special in Bermuda, and if it's fine weather in January and February, you can still swim as well as enjoy strolling, birdwatching, golf, tennis and more. Those who have visited before know that Marley Beach is one of those truly magical places where memories are made that you will treasure forever!